Welcome the New Year with NEW Payer Contracts! Happy Holidays! As the year comes to an end, it’s time to focus on 2018 and ways to increase your payer contracts’ reimbursements. Let us help make the new year profitable for your company! As our gift to you, we’d like to offer a FREE managed care consultation. You have nothing to lose, and everything to gain. Contact us today to get your free consultation to build out your payer network and grow your business or practice. We work with all types of providers including Medical Practices, HME / DME Companies, Laboratories, ASCs, Hospitals, Behavioral Health Companies, Home Health Companies, Substance Abuse and Rehab Companies / Facilities, Infusion Therapy Companies, Wound Care Companies, and other Ancillary providers. Don’t wait to take advantage of this valuable offer. Kick off the new year with new payer contracts! Contact us via email at info@healthcents.com or call 800-497-4970. For more information about Healthcents Inc., its products and services, go to www.healthcents.com. How to avoid payer contract landmines! What to look for and how to avoid landmines! When you are presented with a payer contract, there are several landmines that you may encounter. One of the most common and yet often misunderstood potential landmines is the “lesser of billed charges” language that is found in almost all payer contracts. What exactly does this mean and how can you be sure you are getting the maximum reimbursement? To get immediate access to this valuable information, click here now. This article was written by Steve Selbst, CEO and Co-Owner of Healthcents Inc. You may contact Steve, at any time by reaching out to him at 831-455-2174 or emailing him at selbst@healthcents.com. For more information about Healthcents Inc., its products and services go to www.healthcents.com. If you are a DME / HME company, Medical Practice, Behavioral Health Company, ASC, Home Infusion Company or Other Ancillary Provider, you know it’s extremely challenging getting contracted into closed payer networks. 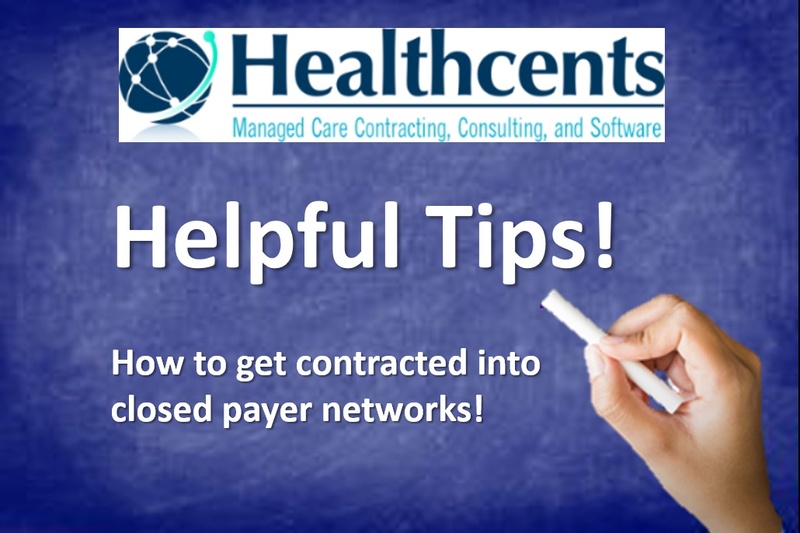 Healthcents Co-owner and CEO, Steve Selbst, is sharing some valuable tips that will teach you the steps you need to follow in order to successfully get contracted into closed networks. To get immediate access to the article, click here now.